Graduating from college is no easy feat, but for one agricultural education alumnus, it just wasn’t enough. Will Johnson (’17) has went above and beyond after graduation from Kansas State University. 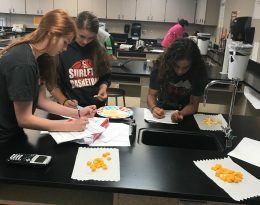 After student teaching in the spring of 2017 at Cimarron High School, he took a leap and accepted a job as a teacher at Sublette High School, a nearby school that didn’t have an FFA program – that quickly changed. Students at Sublette High School learn about FFA Career Development Events in their new agricultural education program. During the summer, Johnson converted the essentially unused shop from storage to a working environment and began paperwork to start an FFA program at the school. This fall he is teaching an introduction to agriculture class for eighth graders and an agriculture, food, and natural resources class; an animal science class; and an agricultural structures class for high school students. In the future, he hopes to add a plant and soil science class and research in agriculture class to the curriculum. Furthermore, Johnson is looking forward to getting kids involved in career development events and taking his officer team to the National FFA Convention held in Indianapolis, Indiana, this October. Coming from a town that didn’t have an FFA program in his high school, Johnson says he can relate to what the students and community are feeling with the new addition.